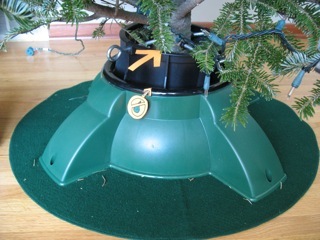 Mr. Shifty is a nice, sturdy, and fairly expensive Christmas tree stand. He's "shifty" because you tighten the screws, and then press a lever to shift the tree to the desired position, which is nice. Be warned, though, that he is pretty tricky. He is constructed with two black circular rims close together (see photo). If lighting is dim and/or branches and/or gifts are partially obstructing your view, he may lead you to believe that you are pouring water into the large water well (large arrow), when actually you are pouring it just past the first black rim (small arrow) -- which empties directly to the floor below. Please note also the attractive and freshly refinished hardwood floors in the photo -- thanks, in part, to Mr. Shifty's deception. This, of course, explains why a Gizmode is needed under the tree. My thanks for the careful illustration of how easy it could be to inadvertently water your wood floor instead of your Christmas tree. Mr. Shifty is, indeed, deceptive! I caught your reference to previous wood floor damage due to Christmas tree mishaps, and that your wood floor has been refinished, since. a Gizmode, at $24.95, is far cheaper than a wood floor problem. Still, I'm rootin' for you and your floor! So be on the look out New Year's Day. Thanks!